Popular K-pop indie band Busker Busker’s leader, Jang Beom-jun, 24, will tie the knot early next year with his pregnant girlfriend, Song Ji-soo. Song is an actress who turned 20 and made debut last year in an MBC TV’s drama. Born in 1989, the musician made his debut in 2011 as the band’s leader through the music audition TV program “Superstar K3” on the cable music channel Mnet. 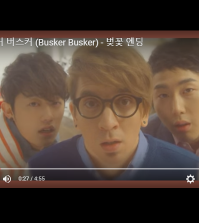 In March of last year, the band released its first full-length album, titled “Busker Busker 1st Album,” which was a big hit. Its second album was released in September.